Response: When women are told that there is something abnormal on their screening mammogram that can cause stress and worry while undergoing additional testing, even when they are later told that there is nothing wrong. We wanted to know if receiving a false positive screening mammogram would cause women to think twice before getting their next screening mammogram, and maybe delay coming back for their next screen. 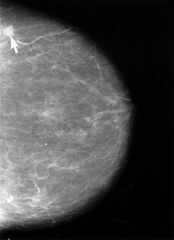 This is important because patients who have a false positive experience may have higher chance to develop breast cancer at a later point in time. Therefore, it is important to understand their screening patterns to better educate and inform them about the importance of adhering to mammography guidelines and emphasize the importance of returning on schedule for their next screens. Response: Mammography has few limitation however it has been shown to reduce mortality through early detection of breast cancer. Although it is stressful, worrisome and burdensome to go through work-up that does not yield breast cancer, I would encourage all women (specifically delayers) to adhere to their mammography screening guidelines and continue to receive their mammograms as scheduled. It is important to also mention that in this study we were not able to account for “patient leakage”, that is those patients who may have received their next screening mammogram at a different organization. This may have contributed to the difference we observed in delay between false positive and true negative; however, when we looked at those who had at least two screens in our system (that is only those who remained in the system), women with the false positive result were still delaying their second screen compared to those with the negative finding. Response: I would like to see whether these results can be replicated in a different setting and in different population. Also, with the emergence of 3D mammography, which has been proven to reduce recall rates and improve sensitivity, I am interested in looking at the impact of 3D imaging on recall rates and FP and whether we still are seeing more delays in screening behavior after a false positive result compared to true negative. This entry was posted in AACR, Author Interviews, Breast Cancer, Cancer Research, Mammograms and tagged breast cancer, cancer screening, mammograms by Marie Benz MD FAAD. Bookmark the permalink.